Wayne Cheung, senior business systems analyst in Campus Life Services, received the Chancellor Award for Public Service for staff at last Friday’s Founders Day Awards Luncheon. 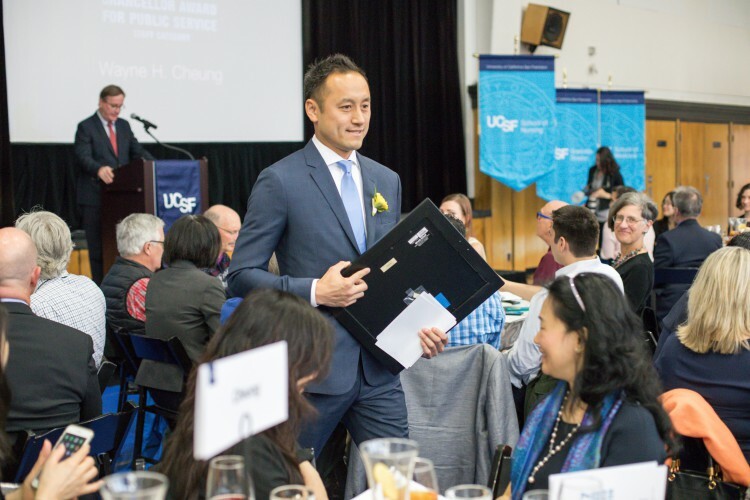 This year’s UCSF Founders Day Awards were given to 12 faculty, staff and students to recognize their contributions in the areas of public service, exceptional service to UC San Francisco and excellence in nursing. Cheung’s work outside of UCSF includes establishing and leading the Nepal Education Initiative Organization (NEIO), which is a charitable organization that works to facilitate modern education by building schools for children in geographically disadvantaged regions. Since NEIO’s founding in 2008, it has constructed four buildings and 16 classrooms to serve more than a thousand students as well as other physical structures, including libraries and technology labs. Cheung learned of the opportunity to help the Nepalese people when a friend told him that the only school, located in a remote village of the Himalayan foothills, had been destroyed in a landslide. Children from surrounding villages had to hike several hours each way just to attend classes in Nakote, all the while, arriving to learn in outdoor makeshift tents that posed considerable safety hazards. Inspired by what he witnessed as tremendous student and community tenacity for education, despite the lack of proper infrastructure and resources, Cheung started recruiting volunteers and fundraising in the San Francisco Bay Area, New York, Japan, Hong Kong, China, and Nepal. These efforts resulted in the formation of Nepal Education Initiative Organization (NEIO). Cheung was nominated by Timmy Ta, Campus Life Services Business Systems Development Manager, and Cindy Yoxsimer, Campus Life Services Business & Technology Services Director.